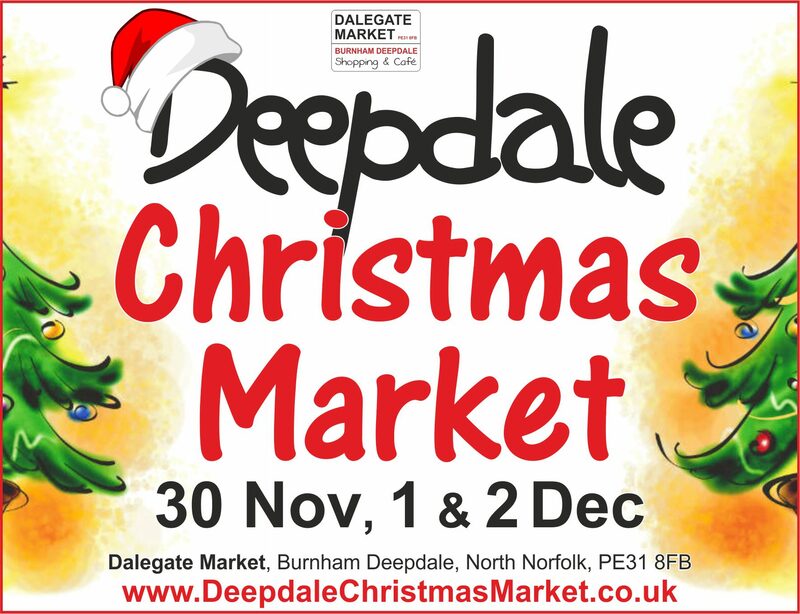 In eight weeks’ time, the 10th annual Deepdale Christmas Market takes place on Friday 30th November, Saturday 1st and Sunday 2nd December at Dalegate Market, Burnham Deepdale on the beautiful North Norfolk Coast. More than 130 artisans and producers join the permanent shops and cafe to create one of East Anglia’s best festive markets. None of the organising team can quite believe that this year is the 10th Deepdale Christmas Market. From tiny beginnings when a few hardy stalls joined the shops and café of Dalegate Market, to becoming one of the largest and most enjoyable festive markets in the East of England offering three days of wonderful Christmas shopping. There will be the usual things people love about Deepdale Christmas Market – the amazing collection of artisans and producers, lots of lovely food and drink, present ideas for everyone on your shopping list, FREE entry, and of course entertainment throughout the weekend. But because it’s the 10th annual market, the organisers felt they should add a few specials to the event. There will be more decorations, more entertainment, and most importantly they’ll be supporting three extra local charities – The Benjamin Foundation, the RNLI and Hunstanton Lions Club. “We usually support a few local charities each year, with a free stall, such as the RSPB, Norfolk Wildlife Trust, Wells Community Hospital, St Mary’s Church and Brancaster School. However, for our 10th market we are working with five extra charities to really help their festive season fundraising. As always car parking is free, but this year The Benjamin Foundation, the RNLI and Hunstanton Lions Club will be supplying volunteers to help park, and hoping customers will leave them a donation in return. We are suggesting a donation of a £1 a car, which will help these charities raise some much needed festive season funds.” explains Jason Borthwick, one of the organising team. As usual there will be three large marquees around the Dalegate Market shopping site, full of more than 130 wonderful artisans and producers – the Dalegate Tent, the Walkway Tent and the Orchard Tent. There will be food courts beside both the Walkway and Orchard Tents, and many outside stalls dotted around those marquees. In the Brick Barn and Courtyard by the Backpackers Hostel, there will be many more stalls, and over in St Mary’s Church there are more stalls, and the church’s own fundraising cafe. To celebrate ten years, the entertainment programme has grown. The Dalegate Stage by Fat Face will be the usual home of choirs, buskers and other fantastic musicians. The Orchard Stage is moving and has grown, with a more diverse selection of music. The Backpackers Stage in the courtyard will play host to many more musicians and singers. And St Mary’s Church will also have an entertainment programme. Don’t miss the Christmas Jumper Flash Mob at 2pm on Sunday 2nd December, when everyone wearing a Christmas Jumper is invited to join an on-mass photo in the courtyard of the Backpackers Hostel. If you enjoy Christmas, then you’ll enjoy the Deepdale Christmas Market. Take your time to slow down, grab a drink, wander the stalls, browse, consider, tick presents off your list, get something to eat, and then take another wander … You’ll be amazed what you see on your second and third wander around, that you missed on your first browse.